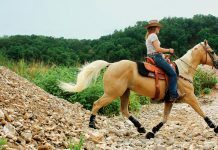 These exercises will help get you and horse fit and ready for the trail. 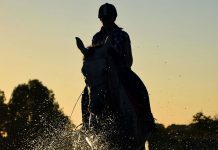 It’s important to keep your trail horse and yourself fit even when you can’t make it out on the trails due to bad weather or time constraints. Horses are more willing to perform when they can breathe easily and their muscles don’t hurt from being overworked. When a horse is gasping for air, he can become stressed and anxious. A cardio workout can be helpful, as can doing exercises that will stretch and strengthen his muscles. Also, to maintain your safety when riding trails, you need to have a strong lower leg and core to keep you balanced in the saddle. 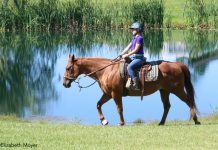 For the following exercises, your horse should already be able to relax and work on a loose rein or with light contact. These exercises can be done in 30 minutes or less (five- to 10-minute segments) and in any flat riding area. 1. Two-point or Standing: Start your first five to 10 minutes walking on a loose rein to allow your horse to warm up and stretch his back muscles. During this time, you can do some basic leg-strengthening exercises. Practice the two-point or standing position by relaxing your heels down, bending from the hips so that your shoulders are over your knees, and then pushing up so that you are up and out of the saddle. You may need to use your horse’s mane or the saddle horn for balance. If you can’t stay in this position for the full five minutes, break it down to one- to two-minute increments and work up to five minutes over time. When doing this exercise correctly, you strengthen your lower legs and core. You can also try stretching up and sinking down in the saddle with the rhythm of the walk: Stretch up so you’re almost standing, then gently sink back down until you’re almost sitting, and repeat. 2. Posting Trot: Pick up a posting trot on a loose rein or with light contact. The goal is to maintain this for the entire five- to 10-minute length of time. When your horse is on a loose rein in the posting trot, it allows him to stretch low and use his back muscles. These muscles help him when going up and down hills. Working in the trot is also a good cardio-builder for your horse. Posting is helpful for you, as well, because it strengthens your lower legs and requires cardio strength. If necessary, rest and build up to five to 10 minutes. 3. Ground Poles: You will need at least three to five poles, each about 10 feet in length. Set them up randomly in your riding area and walk over them. 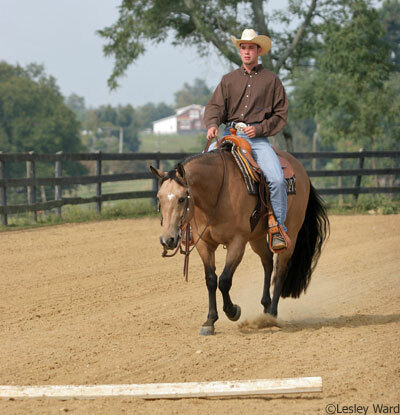 When your horse goes over them willingly, pick up your trot and ride over the poles in two-point or a posting trot. Pretend you are on a trail ride going over logs or brush. Practice in both directions. Laying out the poles randomly requires you to use your legs to turn your horse and stay balanced while going over the poles. These seem like easy and quick exercises when one is pressed for time.